foot talk: Socks 'n' Sandals : Who's bad ? Socks 'n' Sandals : Who's bad ? 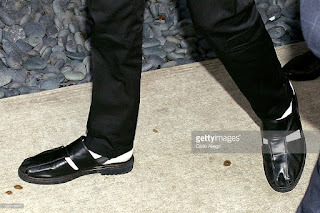 Revelations: When Michael Jackson was photographed wearing white socks with his sandals and it caused a real buzz with the paparazzi. Fashionista went ballistic over the advisability or otherwise of wearing socks with sandals. 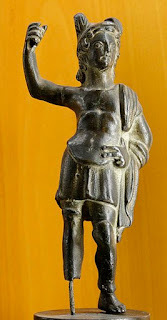 Long considered a fashion faux pas, maybe fashion divas have overlooked the Roman Invasion. Excavations of a Romano-Celtic temple complex at Tabard Square in Southwark, London unearthed a bronzed foot, which is by itself a rare find. However worse to come and the pedal extremity had the fashion audacity of wearing socks and sandals. How uncouth. It has long been thought the humble sock was around 2000 years ago and no reason why it would not be worn but this is the first actual physical evidence to confirm it. The weather in Britain at that time was terrible. (What’s changed?) and Tacitus recorded this at the time. Archeologists are still undecided but believe the foot may have belonged to a statue of the god, Camulos (Mars) who was worshipped in northern France and Britain. Inscriptions of the god's name have been found elsewhere on the temple site. 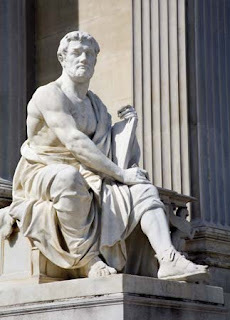 Alternatively, the foot may be from a statue of an emperor. Since statues were never made of the plebs it may just have been an isolated case of bad taste. 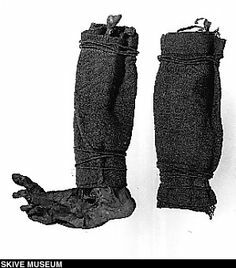 Leg coverings have been discovered in bog bodies and bodies trapped in glaciers, which predate the current, find. 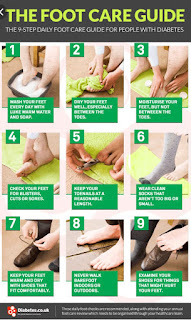 So people in colder climates would most certainly cover their feet for protection. It would take until knitting was discovered before actual socks, as we would understand them, to appear as common costume accessories. Another discovery in Somerset set the archeological world on its feet because the Iron Age shoe is thought to predate previous finds of Roman sandals. The shoe is a rectangular bag of leather but has vertical stitching at the heel and six pairs of lace holes in the vamp so it is definitely a shoe. The shoe was found at Whitehall Quarry, near Wellington, was the equivalent to a modern size 9 or 10, and was so well preserved that the stitching and lace holes were visible in the leather. Usually animal and vegetable materials perish in the ground but due to unusual conditions the artifact was preserved in pristine condition thanks to the clay which surrounded it. The shoe has been dated to between 2000 and 2500 years old. The first Roman Invasion of Britain was in 55 BC. 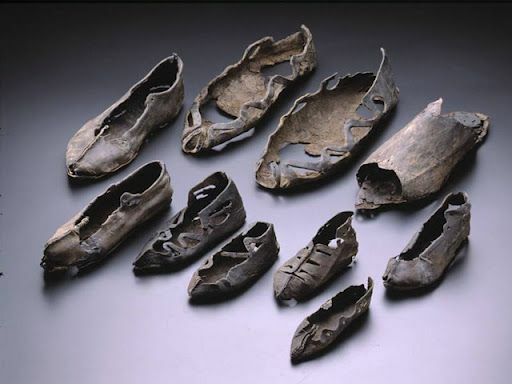 Footwear from this period is extremely rare although a handful of relics have been found in other European countries. The shoe had no partner and experts believe it may have been left as a lucky charm, a common practice in the middle ages. When a cache of Roman Sandals was found in York, England, many had been worn. Surprisingly from scientific analysis of the examples, which spanned children to adult sizes, experts found the same wear marks as would be seen on modern shoes. It appears in two millennia, the anatomy of human feet has not changed despite the influence of footwear. Socks and sandals – Who’s Bad? Labels: Socks 'n' Sandals - Who's bad ?